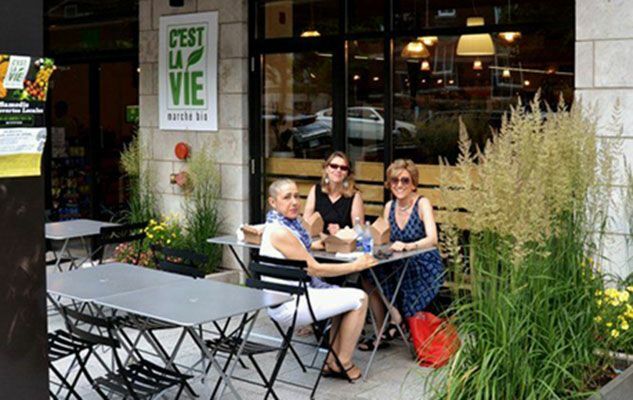 A terrace, health food store and farmer's market: "C'est la vie"
I would like to share a wonderful discovery: the new health food store C’est la vie at 5329, avenue du Parc, Montreal. As I walked along avenue du Parc on Saturday morning, my eyes were drawn to Cadet Roussel farm’s organic fruit and vegetable market on the terrace in front of this store. The ambiance inside was amazing and it got even better at noon when Chef Stéphanie Audet hosted a culinary tasting. I went back on a weekday to sample an absolutely delicious organic dish of the day (salmon with apple, accompanied by zucchini and rosemary potatoes). Because C’est la vie not only sells a wide range of quality organic products, it also prepares a wonderful variety of cooked dishes in the store that you can take away or eat there itself (on the terrace in summer, or at the large table by the window on rainy days or in winter).